Depart International Tribhuvan airport and fly eastwards parallel to the Himalayan range and land at Lukla airport which is usually crowded by trekkers in thousands, on their way to Everest country. 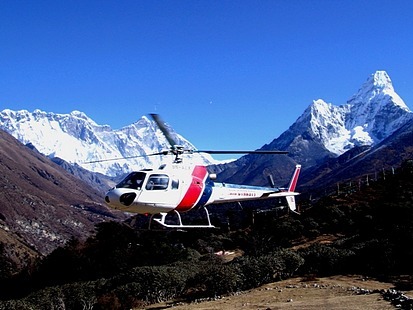 From Lukla you fly toward Everest area providing dimensional vision of the mountains whose nearness would be the prime attraction of this flight. The massive Everest hulk is the dominating feature here, surrounded by other mighty mountains in their own rights. Another landmark of this flight is landing at Thyangboche Monastery, the Vatican of the Sherpas, the world famous “Tigers of the Snow”.